FOOTBALL: A BRACE from Ryan Harkin helped Coventry Sphinx secure their fifth consecutive league win on Saturday. 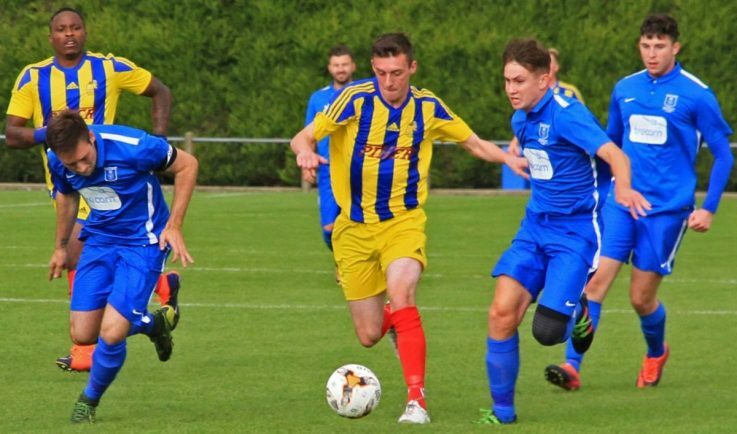 Sphinx faced relegation candidates South Normanton Athletic away from home, and another three points for Lee Knibbs’ men ensured the promotion race is very much on. Knibbs made one change to the team that beat Quorn FC 5-0 at Sphinx Drive, Aaron Donaldson came into the side on the right of midfield. The game started in lively fashion and it didn’t take long for the visitors to open the scoring. Donaldson’s through ball sent Harkin through who scored the first of two goals to hand Sphinx an early lead. Sphinx then had a goal disallowed when Faulkner pounced on a loose ball to score – but the linesman cut celebrations short when his flag was lifted. There was no such luck for Athletic on 17 minutes though when Donaldson was tripped in the penalty box, meaning Woodward stepped up to convert and double Sphinx’s lead. Harkin then made it three for Sphinx after Guest stepped out of defence to play the striker through to seemingly put the game beyond Athletic’s reach. Determined not to throw the game away, Athletic pulled a goal back on 38 minutes with a strike from close range. The hosts started the second half with more intent and were soon threatening Sphinx’s back four – who remained firm – with a series of runs on both flanks. Knibbs’ men weathered the storm though and were soon on the attack themselves. Harkin was inches away from helping Sphinx regain their three-goal lead on 65 minutes. Athletic took full advantage of the missed opportunity to move within a goal when a right wing cross was finished at the back post. An immediate response from Sphinx came and only the cross bar stopped Faulkner re-establishing the two goal advantage after good work from Harkin and Towers. Late pressure was applied by the hosts, but a pair of substitutions steadied Sphinx’s nerves as they played out the game to claim the three points. Sphinx are next in action on Saturday when they travel to AFC Wulfrunians looking to extend their impressive run of form.